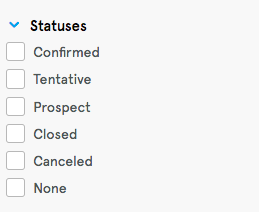 The 'Bookings By' Reports will automatically be filtered by Event Date: Last 12 Months with Status of Confirmed, Tentative, Prospect, Closed and None. However, you can adjust the filters to meet your needs. 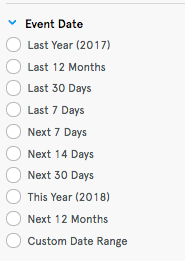 Below are all of the 'Filter by' options for the 'Bookings By' Reports. The Booking Owner associated with a Booking. Locations accessible by logged in user. 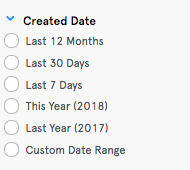 Date a Booking was created in Gather. Event Date associated with a Booking. The current status associated with a Booking. What is the Bookings By Location Report? What is the Bookings By Event Type Report? What is the Bookings By Owner Report? What is the Bookings By Channel Report?